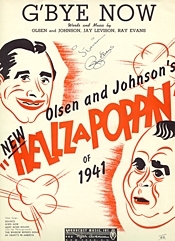 One day in the early 40’s, Ray saw a publicity item stating that Olsen & Johnson, then one of the most powerful acts in show business, were looking for new songs for their hit show “Hellzapoppin’”. Unfortunately, that PR item was only true inside the mind of the misguided publicity hack that planted it. But, not knowing this, Ray wrote to Olsen & Johnson and told them that Livingston and Evans had great songs for them. In another stroke of good fortune, Olsen & Johnson had recently hired a new secretary who, not knowing any better, stuck Ray’s letter under Ole Olsen’s nose during a letter-signing blitz, and next thing you know, Jay and Ray were presenting themselves (as the “invited guests” they thought they were) backstage after a “Hellzapoppin’” matinee. Olsen was obliged to listen to their songs, having signed the letter, and thus started a new and very important relationship. They were assigned to write many songs for Olsen & Johnson for numerous charity events, and some songs even made it into “Hellzapoppin’”. One of these, G’BYE NOW, made The Hit Parade of 1941, giving the guys a much-needed shot in the arm (and boost to the bank account).